Loathe vs. loath: What’s the difference? 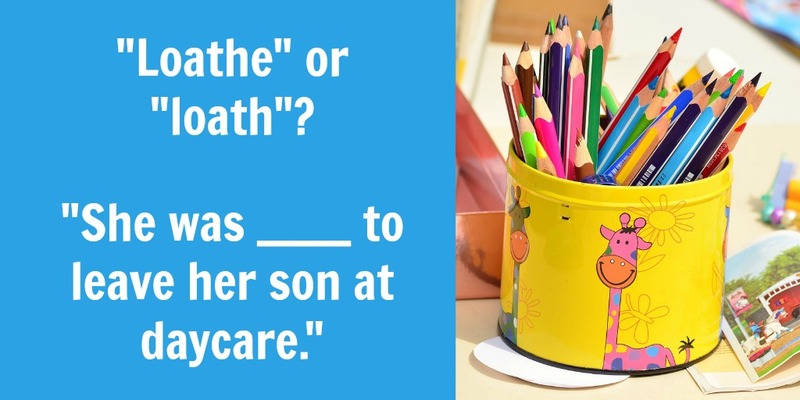 If you had to guess what the difference between loathe vs. loath is, what would you say? Would you say that they are (a) different ways of spelling the same word or (b) two different words altogether? When you’re thinking about the difference between loathe vs. loath, remember that loathe describes the act of really disliking something (or someone). So now you know what loathe means. But what about loath? When you’re thinking about the difference between loathe vs. loath, remember that loath means reluctant. Unfortunately, we don’t have any clever tricks to help you remember the difference between loathe vs. loath. (If you’ve got one, let us know!). Loathe vs. loath look like they could be different ways to spell the same word. But they aren’t. Use loathe to say that someone dislikes something. And use loath to say that someone is reluctant to do something. Would you use composed or comprised in this sentence: “The house was _______ of three rooms”? Find the answer in our post on the difference between compose vs. comprise.